FreeTelly is one of the best free sources that can be used a Kodi alternative on Windows 10 PCs and laptops. You can apply instructions of this tutorial on Windows 7, Windows 8, Windows 8.1 devices as well. FreeTelly is perfect for those who want to avoid going through the process of installing and setting up Kodi and its Kodi add-ons/builds. FreeTelly is a better option than Kodi in a sense it doesn’t require a lengthy installation process. Moreover, you can enjoy all Kodi Add-one with FreeTelly without having to install each one individually. 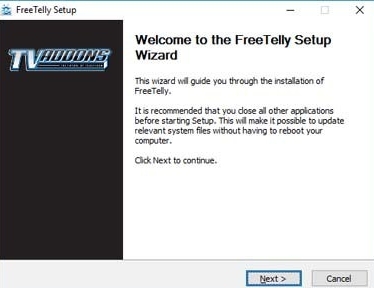 Now let’s see how to Download FreeTelly and the process to Install FreeTelly on Windows devices. 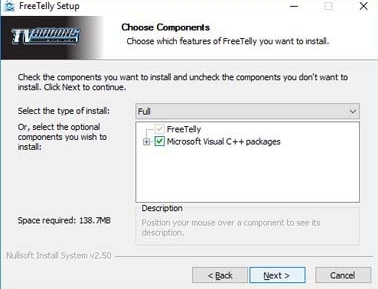 1- Download the Installer file for FreeTelly Windows. 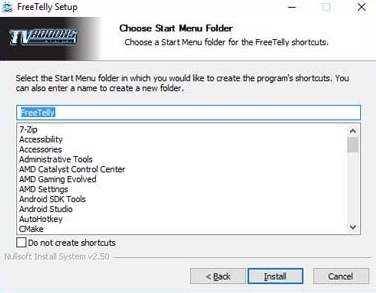 2 – Launch the FreeTelly Windows Insatller.exe file on PC and hit Next button. 3 – On the next setup window, hit Agree button to continue. 4 – Now without making any changes to the default installation location on PC, click on Next button. 5 – Then, click on Next button but don’t make any changes to the destination folder location. 6 – Then, click Install button to start the installation process. 7 – Wait for the installation process to finish as it sets up all add-ons and builds on your Windows PC. 8 – Once done, hit the Finish button while keeping the Run FreeTelly box checked. 9 – Now click the OK button on the next screen. 10 – On the next screen, click Click Here to Finalize Installation. 12 – Now wait for the configuration process to complete on your device. 13 – Hit OK button when the process is finished on your Windows PC. 14 – All done. 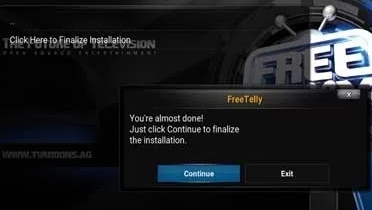 You have successfully installed FreeTelly for Windows free on your PC/laptop. Enjoy FreeTelly Kodi alternative on your Windows PC or laptop and don’t forget to share with friends.